Korg LP380-88 Key Digital Piano Review - Are you ready to learn more? Korg is known for their electronic products, these include synthesizers, iOS equipment, drum sets, and stage pianos. You will likely have heard of Korg in the DJ and electronic music world. They are one of the most popular companies for that market. So, it makes sense that their LP380-88 Key Digital Piano would be top of the line. 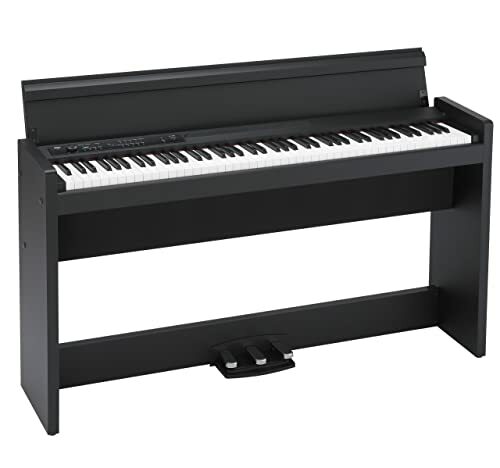 This product is the highest quality digital piano that Korg produces. It is a part of their home products series. Want the whole story about the Korg LP380-88 Digital Piano? Read on. When looking for a digital piano, you need to find one with specifics that will work with your home, wants, and needs. These are large and expensive products, so you should definitely do your research before you make your purchase. Dimensions and Weight: 53.35 inches x 13.82 inches x 30.39 inches, 81.57 lbs. The features of the Korg LP380-88 proves why it is such a high-quality product. All three of the features listed below prove why you should choose the Korg LP380-88. If you want great sound in your digital piano, then you’ve come to the right place. The Korg LP380-88 comes with thirty different sounds and a number of effects. First, the sounds on the Korg LP 380-88 are broken into three banks. You can choose between five different acoustic pianos, an electric grand piano, six different electric pianos, harpsichord, two different clavichords, vibraphone, marimba, three different acoustic jazz organs, three different pipe organs, three different strings, and three different choir settings. Korg’s thirty voices are not as many as you might find on other digital pianos. Take for example the Yamaha digital pianos, which occasionally include more voices on their digital pianos. 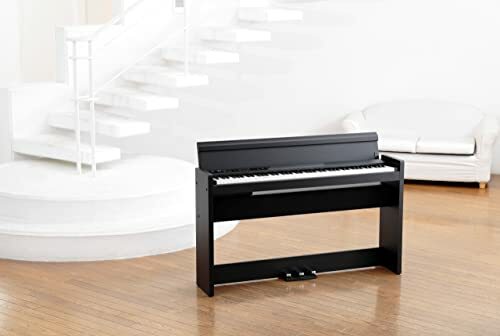 We’ve reviewed Yamaha digital pianos on our site, including here, here, and here. However, the clarity and realism of all of the Korg LP380-88’s sounds make them some of the best that we’ve found. If the thirty sounds of the Korg LP380-88 weren’t enough, there are also a lot of ways for you to vary the sound. This product comes with nine different effects. You can choose between three levels of the three different effects: brilliance, reverb, and chorus. Therefore, the Korg LP380-88 has almost ultimate variability. One of the top reasons for purchasing a digital piano is the extra functionality that you get for your money. Like the Yamaha YDP 143 Digital Piano, the Korg LP380-88 comes with an included song book. The song book includes thirty demos (ten are sound demo songs and twenty are piano demo songs). You want to purchase a digital piano that includes demo songs or songbooks because they help your technique. Plus, they are a great way to get to know your new product. That Korg includes thirty means that when you are done going through all of the demo songs, you will be an expert in using your LP380-88. Another important extra feature of the Korg LP380-88 is the high degree of control that you are given. Controls included in the product are power, volume, piano song, transpose, function, touch, brilliance, reverb, chorus, bank, sound x 10, up, down, and metronome. Each of these controls has their own options and flexibility. Let’s look at the metronome as an example. When you access the metronome controls on the Korg LP380-88, you can choose to set the tempo, time signature, accent, sound, and volume. Tempo, time signature, and accent are fairly common metronome settings. But, the others—sound and volume—are unique to the Korg LP380-88 metronome. Finally, a feature that can make your decision for you is the look of the Korg LP380-88. This digital piano walks the line between modern and classic design. Korg has made it slim enough to fit into any room. It is only twenty-six cm deep! So, it doesn’t matter where you live, you can fit the Korg LP380-88 into your home. The Korg LP380-88’s streamlined design makes it quite modern-looking. However, the wood key cover and elegant frame make it look like traditional pianos. If you want a digital piano that looks like it could be an acoustic piano, then the Korg LP380-88 is the product for you. The Korg LP380-88 comes with a number of important pros. But, that’s not all . . .
Korg is known for their well-made products. When you purchase from this company, you get product hand created in Miyama, Kyoto Japan. Korg does not mass produce any of their digital pianos. Instead, they use a cell production method, which makes the process more efficient. The Korg LP380-88 has MIDI capability. So, you can use a MIDI module to increase the number of sounds that your digital piano makes. Since Korg creates a number of electronic music products, the MIDI feature is to be expected. The keyboard on the Korg LP380-88 is almost identical to an acoustic keyboard. It has eighty-eight keys, the same number as a traditional piano. Also, the keyboard uses Korg’s patented RH3 (Real Weighted Hammer Action 3). Being able to transfer your skills from a digital piano to an acoustic one is important, so it is awesome that Korg makes it so easy. The Korg LP380-88 has a lot of features and technology that makes it run correctly. With all of this technology comes the possibility of failure. And, unless you are a digital piano genius, you will likely not be able to fix the LP380-88 yourself. Some users have gotten defective units with problems with the dynamics. While the sound is always cited as some of the best, no dynamics is clearly a problem. Thankfully, Korg’s customer service is very good. Obviously, the Korg LP380-88 is an amazing digital piano. It has the quality and functionality of much more expensive models. If you want more high functioning but affordable digital pianos, check out this list. 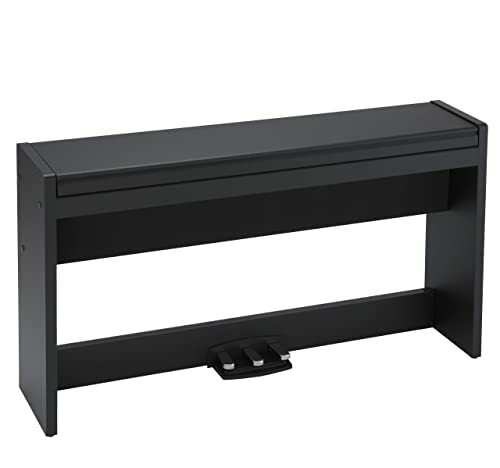 The Korg LP380-88 also a beautiful piece of furniture that will spruce up any room in your home. It’s modern yet classical, and slim design makes it a good conversation starter. Try out the Korg LP380-88 today, and find out what all the fuss is about.